PINE WINDOWS Widely available and affordable, pine has become the material of choice in the industry of wooden windows manufacturing. MERANTI WINDOWS For those who seek high-quality timber windows to size, the popular MERANTI timber is a perfect solution. OAK WINDOWS Hardness, highly durability, and resistance to abrasion have earned the oak wood a reputation of an excellent construction material. Fitted windows, produced using oak tree, guarantee immunity to weather stress and long years of service. Our own patent-protected technology of joining elements makes our products durable, weather resistant, air-tight and offer excellent thermal insulation. Furthermore to ensure that every step of production is carried out with proper attention and care we produce glulam ourselves. This also allows us to have full control over the sourcing of wood, i.e. its certification and that it is obtained without harm to natural environment. Moreover, we use unique, patented technique of joining elements ensuring that our clients get products that are timeless, durable and resistant to changing weather conditions, always air-tight and warm. Thirdly, the type of the window. SINGLE WINDOWS The majority of wooden windows to size in Poland are single windows. As the name indicates, these are simple windows, with a single, framed pane. Their assembly varies depending on the thickness and the structure the window. Although today windows often have multiple sashes and differ in style and finishing, single windows are often used as a replacement of older ones owing to their affordability, wide availability, and high usability. DOUBLE WINDOWS Such wooden windows are most commonly installed in historic palaces, renovated manor houses, residential building and large houses. Dubinski Joinery takes pride in having participated in both, modernising projects, which required joining single and double panes in various types of bespoke windows, and in reconstruction projects, in which our Studio has manufactured numerous double windows based on older, historical designs. SASH WINDOWS This kind of wooden windows is particularly popular the UK and other Anglo-Saxon countries. Sometimes referred to as the guillotine windows – a name astonishingly accurate for their construction, in which the upper part is permanently fixed, while the lower part moves freely up and down – are a splendid combination of beauty and practicality. Such solution saves a lot of space in the room and allows practical use of space on the window sill. 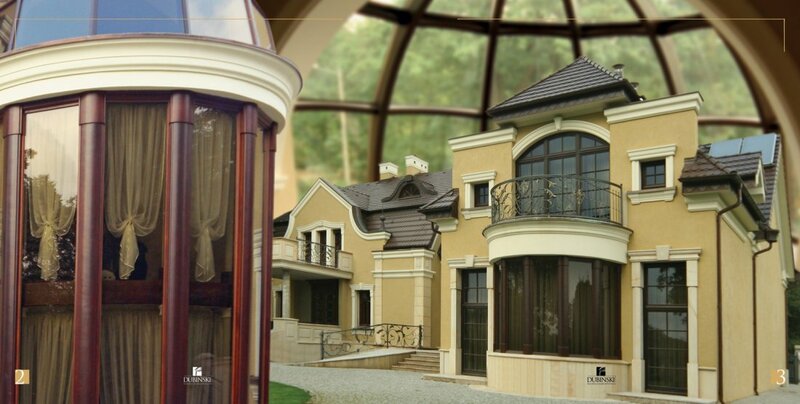 SLIDING WINDOWS This type of windows, frequently seen on balconies, is an optimum solution for high windows to size. A special rail allows fluent motion of one of the sashes, while the other remains attached to the frame. This construction is perfect if gusts of wind are expected – the rail keeps the window in place and prevents it from shutting closed. Although actual ones, called construction muntins, i.e. fine slats that divide a pane into smaller panels, are used less and less frequently, the muntins are not likely to disappear from the market. Without them, it is simply impossible for a wooden window to merge with traditional architecture. Also, they are an important aesthetic element in modern window designs. Intricate carvings, cornices and pilasters can turn a made to measure windows into pieces of art. It is those details that contribute to unique and subtle style and make a particular design of e.g. an oak window truly stand out. Also, in renovation of historic buildings, it is frequently a requirement to use timber as a construction material for replacements of original, often double, wooden windows. Painting is a crucial aspect. Two approaches can be singled out: some clients prefer to emphasise the woodgrain of their custom made windows, while others less so. For the first group, the Lazur varnishes grant the desired effect, while the latter group should rather opt for timber windows painted with white or grey opaque paints. One of the functions of painting a wooden window, apart from the aesthetics, is preventing tannins and resin from leaking. First, the surface of the window is covered with two layers of finishing varnish – so as to obtain the general effect desired by the client. Next comes a layer of varnish the gloss, semi-gloss, or matte varnish. Finally, two more layers are applied for the finishing touch and to provide protection against fading and sunlight. The production stage, at which the elements of the window are painted, is crucial for the durability of timber windows. The best joineries are known to paint the elements separately, before they are assembled. This is crucial for the quality of the final product. With this technique, even if the wooden material inside of the window deteriorates, the properties of window surface remain unchanged. Hence, especially in the case of more costly projects, it is advisable to consult the carpenter, about the production method they use. Should they choose to paint their products only after they are assembled, inevitably, in very few years the surfaces of windows and doors will begin to crack. Can there be a magnificent, say, oak window without an adequately selected glass? Let us not forget that a purpose of the window is not to merely shield the dwellers from cold and rain, but also to offer a frame through which they may contemplate the world outside. Although the market offers a wide selection of glass, throughout our years of experience we have learned to trust only a handful of suppliers. To meet our strict requirements, the glass forms we purchase need to offer impeccable precision of joints, as well as quality, reliable performance, and durability. We offer our clients an ample choice of combinations of bevelled glass, stained glass and metal. Seventh: warm and passive assembly. Proper assembly of timber windows is key to their functionality. Poor assembly of a wooden window will defeat even the best, the most intricate, and the most beautiful design. A so called warm assembly is a method that allows the windows to achieve the peak of their capacity in terms of energy efficiency. This method is particularly advisable for passive houses. Also, it allows the use of such elements as airtight foils, vapour-barrier tapes and bloating tapes – depending on the structure of the wall. Passive assembly is a variant of the warm assembly method. The fundamental difference is that in passive assembly the window is set in the insulation layer of the wall, rather than in the wall itself, as it happens in the case of traditional warm assembly. 12. Large wooden oak windows. Thanks to the large window area the house’s interior is very well lit. Additionally, the use of three panes makes the house warm. 13. Wooden double windows - besides the obvious beauty of double windows, an additional decorative element was used here: metal castings, composed in wood structure. 14. Close-up of the top of a double window. 15. Wooden double windows - white wooden windows, with additional carved decorative elements. 16. Unusual version of bespoke oak windows: Dubiński Joinery Studio - a manufacturer of these windows - aside from using a wonderfully eye-catching Tiffany stained glass, additionally secured it with two P4 panes. 17. Large oak windows in a winter garden. 18. The interior of the winter garden is made of oak. 19. Oaken windows made at the Dubiński Joinery Studio. Custom made, arc-shaped windows are especially noteworthy. At the same time the storeyed (??) windows were decorated with carved decorations in horn, which made the windows optically delicate. 20. Meranti wood windows. Decorated with both Viennese muntins and transom bars with decorative heads. Both semicircular roof windows and the corresponding semi-circular fanlights over the classic windows provide brilliance to the house. 21. The four-leaf arched oak wood window with a beautiful bedroom commode composed around it. 22. Custom made double-wing oak wood windows with arched construction muntins. In our opinion, this solution has provided a unique effect. 23. Oak wood double windows. A very traditional version of windows for the most demanding customers. 24. Railway Station in Malbork. After the renovation it was chosen the RENOVATION OF THE YEAR. We do not mean to brag but we took a considerable part in it. All double pine windows has been restored by us. 25. If someone dreams of a small white house - this one is the perfect answer to this dream. We manufactured double winged Meranti wood windows with delicate carvings on transom bars. Storeyed windows were decorated with Viennese muntins. All these pieces works together beautifully.